The days are short, the season is dark, and the temperatures are low. However, this is no reason to stay inside. 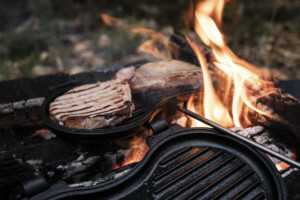 Those who feel tired of the common Christmas procedures, flocking outside as the Christmas and advent season is just perfect for cooking over hot embers. Thus, well-equipped a hearty and traditional Christmas meal succeeds even at the campfire. But also for Christmas celebrations Petromax comes up with a whole batch of good ideas. 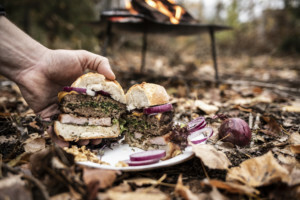 The campfire sets the mood, together with mulled wine in the kettle, hearty kale burgers from the Burger Iron and roasted almonds from the Dutch Oven offer the appropriate food. Christmas classics originally prepared provide for fascinating variation – before, during and after the Christmas holidays. The flames are reflected by the stainless-steel kettle, and there is smoke flavouring mixed with cinnamon, clove and orange in the air. Today, the Petromax Tea Kettle contains not water, but wine. First, to warm oneself up, punch is served. The fire is yet crackling on the Petromax Griddle and Fire Bowl. Simply add the ingredients and hang the kettle over the fire. 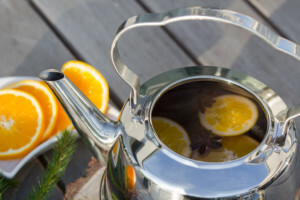 Not much later, the enamel mugs filled with mulled wine warm your hands. By the way, the Petromax Tea Kettles are also perfectly suited for large groups as they are available in three sizes – 1.5 litres, 3 litres and 5 litres. Time for the main course: juicy kale burgers. The winter classic kale – cooked extremely aromatic in the Petromax Dutch Oven and with the Petromax Burger Iron preparing perfect filled burgers is a real piece of cake. 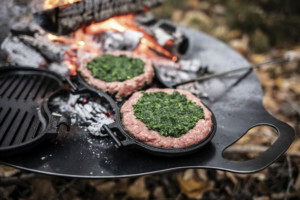 Here, the Petromax Grill and Fire Bowl reveals what it can do: It is a heating source for mulled wine, Dutch Oven and Burger Iron for all those standing around the fire together. At the edge of the plancha plate the burger buns are toasted at the same time. What’s for dessert? With the Dutch Oven, roasted almonds are made naturally easy. The lid is perfectly suited for preparing smaller amounts, for large amounts use the whole pot. 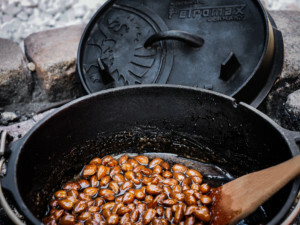 Now it is time to add more logs to the fire and to fill the Petromax Percolator Perkomax with coffee powder. Juicy burgers are welcome all year long. For the festive season, the beef mince is stuffed with kale, which tastes especially well after the first frost. Even cowboys appreciated the hearty and juicy taste of kale. Besides, kale is full of vitamin C, thus it is the perfect supplement to a substantial Christmas dinner. How does the kale get into the burger? No challenge. Thanks to the Petromax Burger Iron you can easily prepare filled burgers. Heat up the Burger Iron in the fire of the Griddle and Fire Bowl and sear the cured pork slices on both sides. From the beef mince form four patties equal in size, place two of them into the bottom half of the burger iron and press a depression in the middle. Fill in the kale and add the remaining two patties on top. 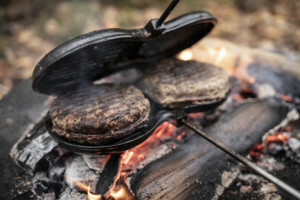 Now put the closed burger iron into the fire and let the patties roast for 10 minutes (after 5 minutes turn the burger iron). In the meantime halve the rolls and toast them at the edge of the Grill and Fire Bowl. Finally, build the burger and enjoy this freshly prepared treat together with your friends. About Petromax: Petromax is a leading manufacturer of equipment for light, fire and outdoor cooking. Its coordinated product world combines tradition and innovation in a unique way. All Petromax products are of highest quality, extremely durable and feature elaborate details. Experiencing pristine nature with traditional and yet well-designed equipment is the focus of Petromax’ product world, which can be acquired through an international network of specialised retailers with currently more than 3,000 shops as well as the online shop. Petromax’ management consists of Jonas Taureck and Dr. Pia Christin Taureck.